Luis Miguel (born April 19, 1970) is a Mexican singer born in Puerto Rico, raised in Mexico to a Spanish father and Italian mother. He is referred to as "El Sol de México" (The Sun of Mexico). He has won four Latin Grammy Awards and five Grammy Awards. I feel that destiny is a mixture of preparation and luck. You can be very lucky, but it is useless if you're not prepared. You can be prepared, but it is useless if you're not lucky. Solitude is good, desolation is bad. I have experienced both. I have that weakness. I think women are one of the most beautiful creations that could be given by nature, by God. Surprisingly, it is not like they say: "In this or in that country", no. There are beautiful women in every country. I think any woman can be the ideal woman. If you can measure your height from head to heaven, he is taller than you. About the short height of Armando Manzanero. I always wanted to have many friends, unfortunately, friends are formed with years, and not everybody know how to respond as a friend. Look, in my personal issues I'm very private. I would like to make clear that all the matters of my family, friends, my love life, is something that is for me, and I also prefer people to invent. It amuses me a lot when I read all the things they invent. I wish I had a family. In the future I´ll try to figure out how to dedicate more time to my personal life, and yes, maybe think about a family, kids, comes an age when the body asks for it. Simply: the practice makes the master. Practice every day, or at least try to sing, as much as you can. And I don´t stop, if I´m not on tour, I´m on a studio, and if I don´t, I do it for pleasure, I do it every day, is something that is part of my life. I listen to everything, all types of music. Luis Miguel has the voice and style of the young Frank Sinatra, so I'm not mistaken when I say that if Frank would have been born in Latin America, his name would be Luis Miguel. This kid has a unique voice. That young man has one of the clearest voices, his throat is a Stradivarius. 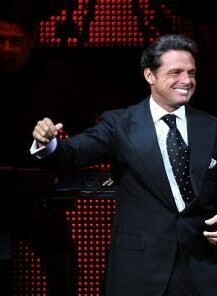 Luis Miguel has something special, an irresistible charm. I love listening to him... his songs are very romantic. I would love to work with him … I love his voice and style. I think that Luis Miguel is the best singer in Spanish. Things have to be recognized as they are. Luis Miguel is the best singer. I'm telling you from the standpoint of a fellow singer, a professional. I dedicate to this and I hear many people singing. I could say it about another person who sing very well, there are many people who sing very well, but he is the best singer and it must be acknowledged. Luis Miguel says profession damaged his listening ability.